The second best headphones for use on planes are industrial noise protection earmuffs and the airline supplied ear buds. 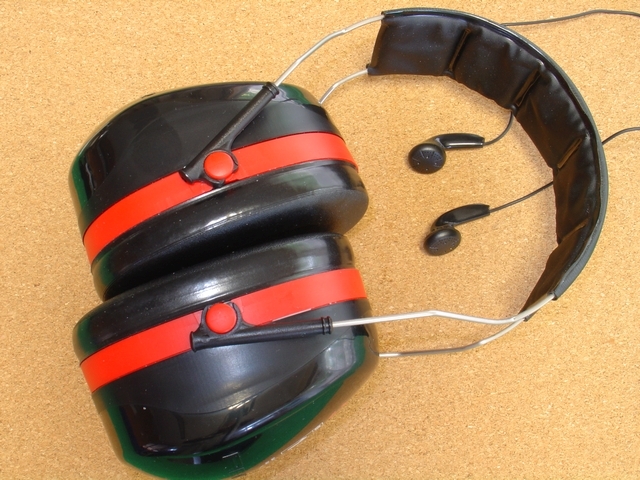 The best headphones for use on planes are industrial noise protection earmuffs and good quality ear buds. This article reports on in-flight tests I carried out on using a combination of industrial ear protectors and ear buds on long haul flights. 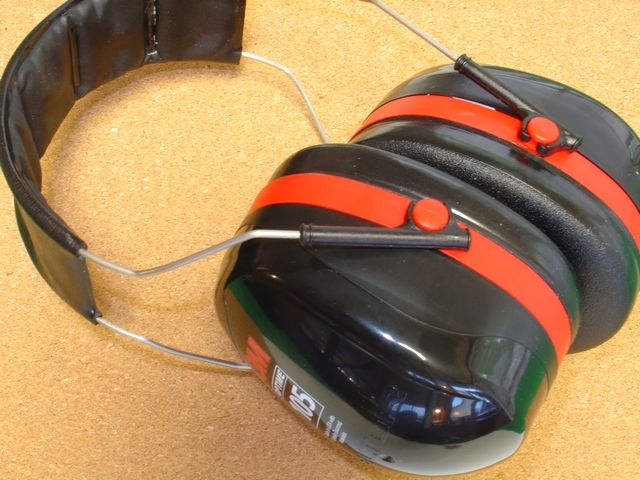 ii) Industrial ear protectors are designed to suppress high frequencies. So combining the two should give good noise suppression ALL the frequencies. As it turned out the expense of noise-cancelling ear buds was not needed. First lets talk about noise, which is measured in dB, the power at each frequency and then averaged over all the frequencies we can hear. See Comparitive Examples of Noise Levels for examples of noise levels. Aircraft cabin noise is ~80dB (“In-cabin noise levels during commercial aircraft flights“), think food blender noise levels. While a 'quiet street' is about 50dB. For sleeping environments, the maximum acceptable intrusive level is 55 dB(A) (U.S. Department of Commerce, 1985). So ideally we would like to get the noise level down to about 50dB across the frequency range. That is we would like ~30dB noise reduction across the frequency range but particularly at the higher frequencies that make it hard to distinguish what people are saying. So making watching movies difficult. To put the frequencies in to perspective, the hum in your speakers is 50/60Hz, middle C (C4) is ~261Hz, C8 (4 octaves higher) is ~4186Hz and voices on a telephone are in the range 300Hz to 3400Hz. People with good hearing can hear sounds in the range ~20Hz to 20,000Hz although only top of the line headphones and speakers will cover that range. 0 dB at high frequencies, i.e. There is no active cancellation at high frequencies. In fact Bose noise-cancelling headphones (and others) actually introduce some high frequency hiss when the noise-cancelling is turned on. So combining Industrial Ear Protectors and noise cancelling headphones together should give an 'ideal' set of headphones for airplane use. That is an industrial set of ear protectors, with good passive noise suppression at high frequencies, placed over a set of noise cancelling ear buds with good active noise-cancelling at low frequencies. In-flight testing was done on two 14½ hr trans-pacific flights, Sydney to San Francisco and return, on a United Boeing 787-9 Dreamliner. 787-9 Dreamliner is supposed to be a quieter plane then previous models. On the Sydney to San Francisco leg I was in Seat 27J. This is the aisle exit row just behind the wing. In this row I found there was a lot of high frequency wind and air-conditioning noise in addition to the low frequency engine noise. On this leg of the trip I used an industrial ear protector purchased from Bunnings, UniSafe Folding Hi-Vis Earmuffs (SLC80 27) ~A$22, combined with the airline issued ear buds. That is only passive noise suppression and no active noise-cancelling. I found the UniSafe Earmuffs are quite tight and not the most comfortable, but the snug fit ensures good high frequency noise suppression. I found they eliminated all the high frequency wind noise and deadened the engine noise to a low level of low frequency background rumble that was not really noticeable, just reassuring that the engines were still running. Think distant waves breaking on a beach. While the fit was tight and I needed to adjust the position of the ear muffs every now and again, I used them for 12hrs and found that I did not want to take them off as the wind noise was so unpleasant. The airline supplied ear buds were not very comfortable but the ear muffs kept then in place and the result was I could easily watch the movies with the volume at less then half level. Removing the ear muffs made the voices unintelligible at that volume level. It is worth nothing that health authorities are concerned about using headphones at high volumes in high noise areas. At the very least trying to watch the movies just using the supplied ear buds is very tiring and prone to give you a headache. All in all it was successful trip with no headache from having to watch movies on high volume or from the tight ear muffs, but I wanted to look for a more comfortable pair of ear protectors and some noise-cancelling ear buds for the return journey. On the overnight return flight (San Francisco to Sydney) I was in Business Class, 4D, in the front most section of the plane. This is quietest part of the cabin but still has a lot of wind noise. For that leg I used a 3M Peltor H10A Optime 105 Earmuff purchased from Amazon ~US$20 NNR 30dB. I found these not as tight on my head, but stiff to adjust. Some user reviews reported these earmuffs broke easily. I dropped mine and the black ear surround popped off but it just snapped back in. I paired them with Audio-Technica ATH-ANC23 QuietPoint Active Noise-Cancelling In-Ear Headphones from Amazon ~US50. These ear buds were more comfortable in my ears than the airline issued Economy ear buds but the Audio-Technica have a very short leads. Also I could not notice any noise cancelling when they were turned on. Just a slight increase in the volume. So I would not recommend them for noise-cancelling. The only positive aspect was the in-line volume control. The passenger seated next to me had a pair of Bose over the ear headphones. He was amazed at the effectiveness of the ear protectors in eliminating the cabin noise, while I notice that the Bose did a better job of suppressing the low frequency engine nose. However when the Bose noise-cancelling was turned on it introduced a high frequency hiss that I think I would find annoying when trying to sleep. It would also mean I would have to watch movies a slightly higher volume. I had considered purchasing a pair of Bose QuiteComfort 20 Noise-Cancelling ear buds, but given that the ear protectors and the airline supplied ear buds worked just fine on the first leg, the ~US$250 (A$350) for the Bose ear buds did not seem value for money. 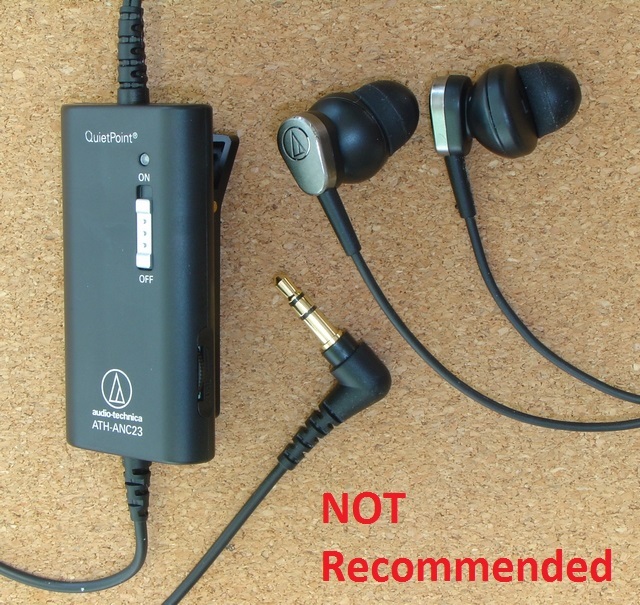 Also a number of Amazon user reviews complained that the QuiteComfort 20 ear buds failed or broke early. So I compromised and purchased the Audio-Technica ATH-ANC23 instead. A waste of money. On United Business Class you are provided with headphones that have a two prong plug, BUT one of the prongs is a smaller diameter. This means you cannot use a 'standard' two prong adapter to plug in your headphones or ear buds. However there is an easy fix, just plug your headphones into the larger of the two headphone holes in the little nook at the top of your seat. That works just fine. The business class seat converts to a flat bed. If you are around 6ft tall, the seats behind the bulk heads have more side foot room then the other seats. That is if there is another seat in front of you it takes up most of the foot room. There are two rows of seats with this extra foot room, row 1 and row 5. Both these rows are next to serving areas and toilets, but with the ear protectors on you won't hear much, if anything. I managed sleep on the lie flat seats while wearing the ear protectors. Sleeping was helped by the 39” x 17” x 2” (100cm x 43cm x 5cm) piece of memory foam, with a pillow case pulled on at either end, that I took to help smooth out the seat contours that become small lumps and bumps when fully extended. (I also find the memory foam helps for those hotel beds that feel like planks of wood.) My carry on case holds no more then the earmuffs, ear buds, memory foam and a pillow. The computer and toiletries go in my small backpack. When watching the in-flight movies, noise in the voice frequency range is the most intrusive. Voice frequencies for comprehension range from 300Hz to over 3400Hz and noise in higher frequencies can hinder comprehension. For example to distinguish “fail” from “sale” you need to be able to clearly hear the frequencies above 3400Hz. That is why suppressing the high frequency wind noise on airplanes is most important. A comfortable pair of inexpensive industrial ear protectors, the higher rating the better, and your favourite ear buds are all you need for a quiet and pleasant flight. The ear protectors do a really great job of suppressing noise at 500Hz and are even better at higher frequencies. In the frequency range from 300Hz and up the 3M Peltor H10A Optime 105 Earmuff effectively reduce the background noise to that of a “quiet street”. The ear protectors also keep the ear buds from falling out as you move about. Active noise-cancelling ear buds should further reduce the background engine hum but will also introduce a high frequency hiss and, in my opinion, are not worth the extra expense. The ear protectors definitely do a better job of cutting the high frequency wind noise then the Bose over the ear headphones. Things to look for when buying ear protectors. 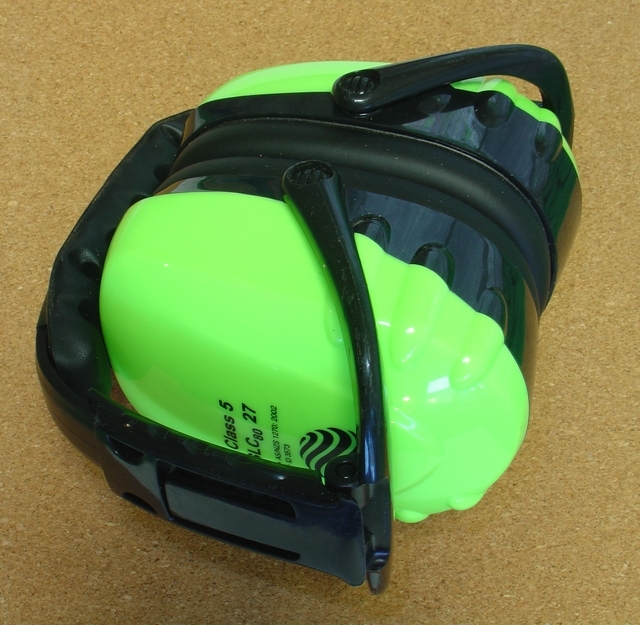 Choose the highest rated pair of ear protectors that are comfortable to ware. Choose large diameter cups that completely covers you ears without pressing on them. Choose wide soft pads to seal well against your head to keep the noise out. Choose a firm fit without being uncomfortably tight. You need enough space inside the ear cup to fit your ear buds without them being pushed into your ear. Finally try wearing them at home for a day, 8hrs or more, to check they are suitable for a long flight.